At 94 kilometers (58 miles) by 39 kilometers (24 miles) in size, the B-09B iceberg is comparable to the state of Rhode Island, which is wider but not quite so long. After lingering near the Mertz Glacier in Eastern Antarctica for several years, the massive iceberg collided with the glacier tongue on February 12 or 13, breaking it away from the rest of the glacier. 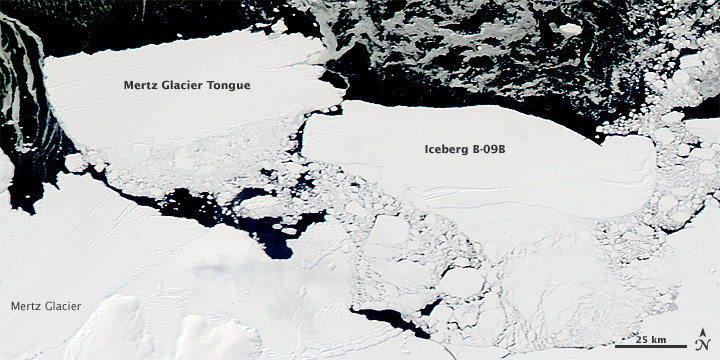 The former glacier tongue formed a new iceberg nearly as large as B-09B. 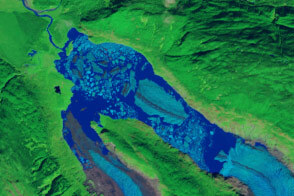 These images, all from the Moderate Resolution Imaging Spectroradiometer (MODIS) sensor on NASA’s Aqua satellite, show the iceberg and glacier tongue immediately before and after the collision. 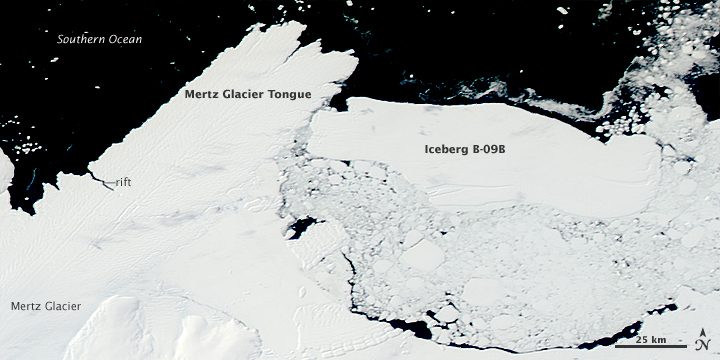 The top image is from February 7, 2010, when B-09B was approaching the Mertz Glacier Tongue. Chunks of sea ice float in the water between the smooth iceberg and the coast. It is clear that the iceberg and the glacier tongue are trapping the ice in place. The water beyond the tongue and the iceberg is black in these images, and contains far less ice. The ice tongue itself is an extension of the Mertz Glacier, created as the ice flows down the mountain and onto the water. Glacier tongues grow longer year by year until they eventually break off, calving a new iceberg. 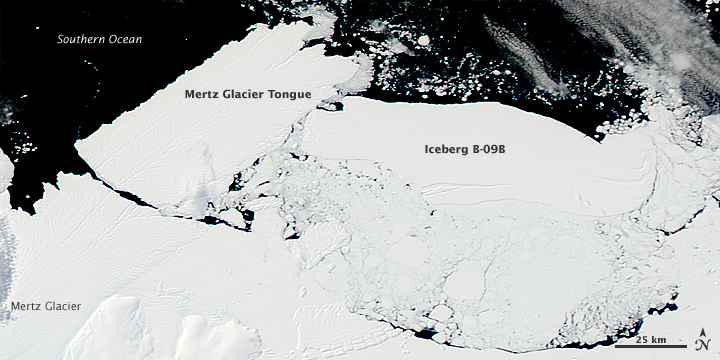 The Mertz Glacier Tongue was beginning to break before the B-09B iceberg rammed it. Dark horizontal cracks were visible in the ice tongue on February 7. Sometime on February 12 or 13, B-09B struck the ice tongue. Clouds hid the event in MODIS satellite images, but on the afternoon of February 13, the clouds had thinned just enough to reveal that the ice tongue had broken away in the collision. The next cloud-free view of the region on February 20 (center image) shows the two icebergs. The glacier tongue had clearly broken along the rifts that were visible in early February. Over the course of the next week, the former Mertz Glacier Tongue pivoted away from the glacier like a door hinged at the point where B-09B hit it (lower image). The iceberg formed from the Mertz Glacier Tongue is 78 kilometers (48 miles) long by 39 kilometers (24 miles) wide and has a mass of 700-800 billion tons, reported BBC News. The glacier tongue had previously contributed to keeping a section of the ocean free of ice, a condition known as a polynya. The polynya provided a significant feeding site for wildlife like penguins. The shorter tongue may not protect the area from sea ice, reducing or even eliminating the polynya and the access to food it provided. The B9 iceberg broke from the Ross Ice Shelf in West Antarctica some time in 1987. It took the massive iceberg more than two decades to drift slowly out of the Ross Sea and along the coast to the Mertz Glacier in East Antarctica. 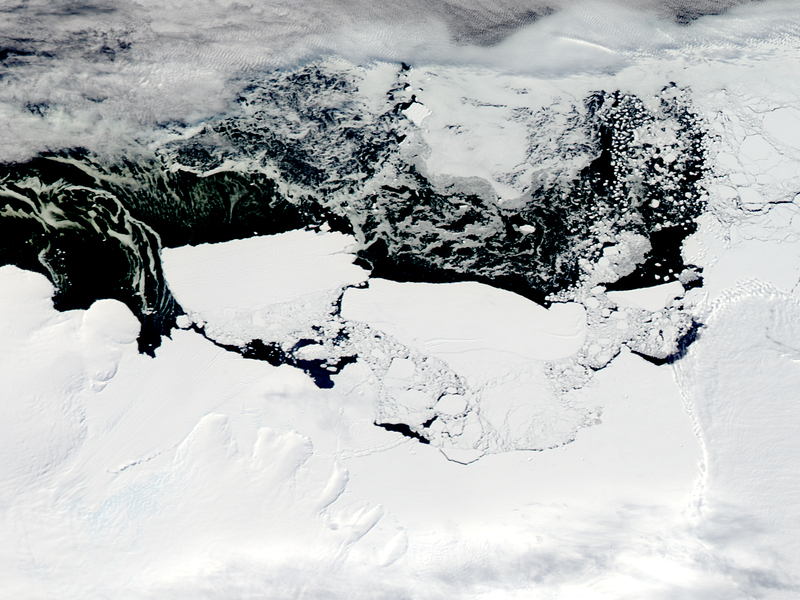 Along the way, it broke apart, one segment becoming the massive B-09B iceberg that collided with the glacier tongue in February 2010. The large images are the highest resolution version of the image available. The February 26, February 20, February 13, and February 7 images are all available in additional resolutions from the MODIS Rapid Response Team. 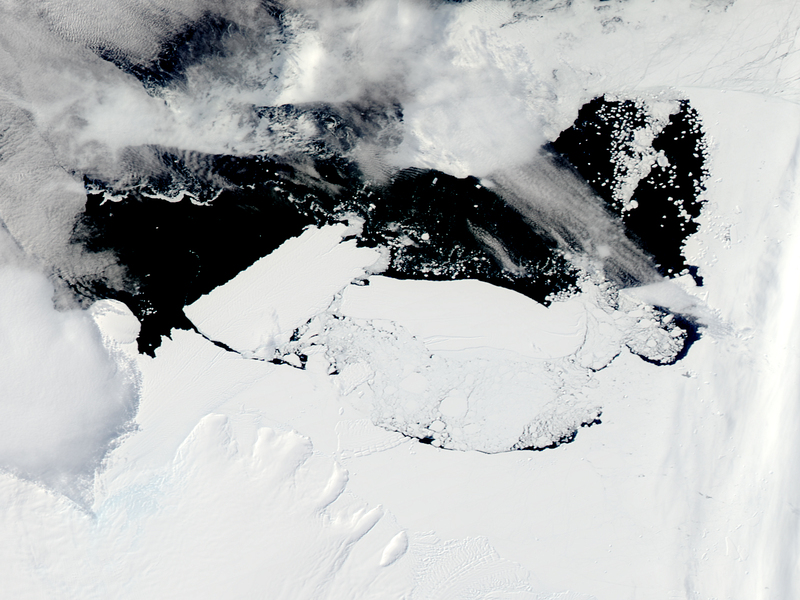 This series of true color satellite images show the massive B-09B iceberg on a collision course with the Mertz Glacier Tongue in East Antarctica. The collision broke the ice tongue away from the glacier, creating another vast iceberg. BBC News. (2010, Feburary 26). 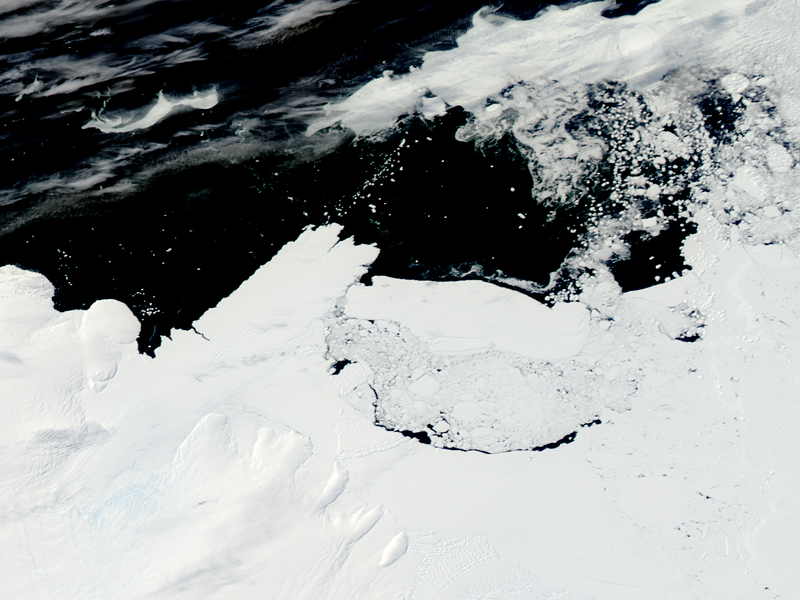 Vast Antarctic iceberg ‘threatens marine life.” Accessed February 26, 2010.